Two little games for the Commodore 64. After years of developing software for the Atari VCS I remembered that a lot of hobby games have been written for the C64, but none (to my knowledge back then) was released on cartridge. Therefore I decided to write a new game and prepare it for play from cartridge - to make it a new game for the C64GS (Game System) console. As the annual Mini-Game-Competition is held on the internet I furthermore decided to limit the new game to 4 kilobytes and enter the competition with it. 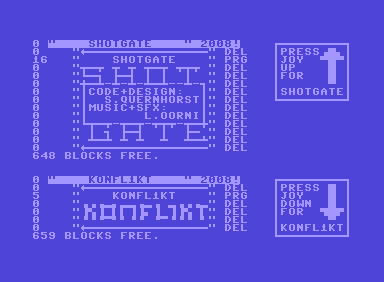 When Shotgate was finished and I got used to programming the C64 again, Konfl1kt was developed to enter the 1 Kilobytes competition, too. Shotgate is a game for one player. You try to survive the 26 rooms of a secret laboratory while testing the new Shotgate technology of jumping between temporary gates. You can control your roboter suit left and right, but you cannot jump. Therefore you have to use your gun and shoot gates to the walls, floors or ceilings. When two gates are set you can enter a gate and are instantly warped to the second gate. Reaching the top right door brings you to the next room. Your ammunition is limited and the time is running out - so be careful and use the ammunition wisely. The introduction music and the sound effects of Shotgate are composed by Lasse Öörni, programmer of the Metal Warrior series. The introduction screen offers a password option to enter any any of the 26 rooms again. This screenshot of the first room shows the blue player and two set gates. Entering the right gate makes you fall out of the upper gate instantly. While falling you can move left and enter the higher platform above. Some levels even require to reuse gates to save ammunition. Are you going to receive the cake? Winner of the "Silver Joystick"
at the 4K MiniGameCompetition 2008. SHOTGATE with an overall score of 85%. 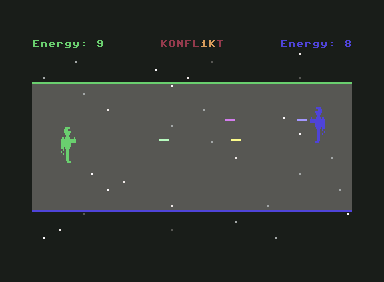 Konfl1kt is a two players game where the opponents face each other in space. Every joystick controls one player and either the top or bottom border of the playfield. The controlled border has got the same color as the player. Pushing the joystick up or down makes your player move. Pressing fire releases up to three shots. Pushing the joystick towards or away the opponent makes the border move up or down. This means that you can push the opponent into your shots by using the border movement. To make the game more interesting, you cannot hold the fire button pressed for unlimited shots. You have to release the fire button to let the shots travel far enough, otherwise they will not hit the opponent. Winner of the "Bronze Joystick"
at the 1K MiniGameCompetition 2008. Both games are written for a PAL Commodore 64. 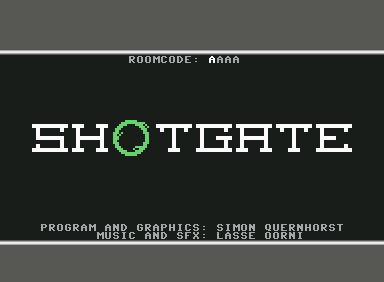 The total size of Shotgate is 4 kilobytes (4096 bytes) - containing all code, graphics, musics and levels. All code, graphics and sounds of Konfl1kt fit into 1 kilobyte (1024 bytes). The cartridge size is 8 kilobytes and contains both games along with the menu. You can download the disk image file here and play it using a C64 emulator or copy it onto a disk for play on a real C64. 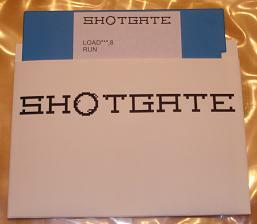 The disk image contains four files: the game files of Shotgate and Konfl1kt and instruction files to both games. Please notice that you use the emulator and my games at your own risk, I don't take any responsibilty for problems occuring to your computer when using an emulator. You can watch a video of the gameplay of Shotgate at YouTube. Both games are also released on disk. The set consists of a color disk with label and a dedicated disk sleeve. The instructions for both games are stored on the disk, too. The price for this set is 5,00 Euro. The additional postage depends on your location. If you are interested please contact me at this address (replace [DOT] and [AT] with . and @ please). Disk with label and disk sleeve. 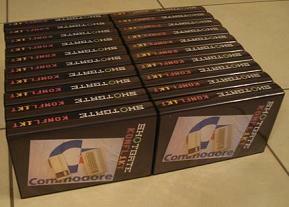 To make these games available to the fans of the C64GS console, a limited edition of 20 cartridges was produced. Theses cartridges consist of a PCB with 8 Kb EPROM and a brand new black cartridge shell. The cart is labeled and the set also includes a plastic box with full color cover, an 8 page manual and a sticker with serialnumber and signature. The menu screen of the Cartridge. A complete copy of the cartridge set. All 20 cartridge sets together. 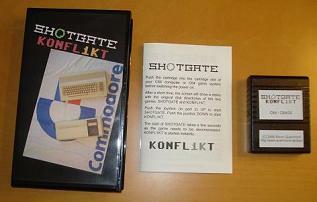 These games for the Commodore 64 were written in 2008 and are (C) by Simon Quernhorst. with the development of these C64 games, so don't bother him with mails. Commodore, Commodore 64, Atari and VCS are acknowledged trademarks of their individual owners.